← One Shot, Two Stories a Success! Must read. Must watch movies. As many know, I’m in the Fifty Fifty challenge, which is why I must do both! MOVIES: Now, as far as movies go, I’ve only seen three this month (last month I saw eight): The Descendants, which still has me wondering, why would anyone cheat on George Clooney? Inside Daisy Clover, starring a stellar cast that includes Natalie Wood, Robert Redford, Christopher Plummer, and a plucky Ruth Gordon. But this 1965 film is such a sad movie about Hollywood in its early days–when actors were under contracts and had to uphold a moral code set by the big studios–that touches upon themes of addiction, mental illness and homosexuality. Whitney Houston as Rachel Marron in The Bodyguard. The third film I’ve seen this month is The Bodyguard. When I learned of Whitney Houston’s passing on February 11th, I felt compelled to watch this film once more. I hadn’t seen it in years, but I remember loving this film and especially, the music. For, Whitney’s music in this film helped me through my divorce. It was inspiring to me then, and this time around, I found it all the more poignant. And though The Bodyguard has a happy ending, knowing what we know now, makes it bittersweet, as in the end, no one could save Whitney from herself. Except, maybe, if Kevin Costner, who gave an incredibly moving eulogy at her funeral on Saturday, had still been her bodyguard. If Whitney’s music touched you in any way, please be sure to check out my Huffington Post story on how her music made a difference in my life. The Weed That Strings the Hangman’s Bag by Alan Bradley – This is a Flavia de Luce mystery, and it’s like reading a sophisticated Nancy Drew mystery, set in the quaint English countryside in the middle of the last century. Flavia is so nifty and knowing. She’s 12 years old and probably the smartest person in her village, cleverer than even the chief of police. Mothers, Daughters, and Other Mysteries by Heather McPhaul – Fellow blogger and stunt woman extraordinaire, also known in some circles as Aging Gal, is a total hoot. She tells it like it is and makes the mundane seem hilarious. I discovered Heather when she was Freshly Pressed in March, 2011. Her post, about planning to one day retire to prison, where all her expenses will be covered–by taxpayers–and health care is free, still remains one of my favorites. It had me laughing so hard, I cried. Her novel, Mothers, Daughters, and Other Mysteries, is about a young woman, Leeann Conklin who, at a crossroads in her life, decides to start her own detective agency in NYC. Leeann has issues with her mom, Ava Gerard, a diva-type who pops in for a surprise visit when she’s in town for the Daytime Emmy Awards. Of course, this all happens just when Leeann gets her first detective gig. Ava joins in the mayhem that ensues, coming up with a few crafty disguises to help solve the crime. I like supporting my fellow bloggers when I can, and I hope you will, too, by reading Heather’s book. It’s a fun, easy read! And speaking of books, I’m excited that, later this week, I’m going to meet best-selling author Jennifer Niven, whose book, Velva Jean Learns to Fly, will be featured at a special event hosted by Adventures By the Book. Now, I just adore Adventures By the Book events, because they’re not just your run-of-the-mill author book signings–they’re an experience! And, for this one, where the theme is all about flying, we’re going to be taking a tour of the San Diego Air & Space Museum. Now, Velva Jean Learns to Fly happens to be a sequel to Velva Jean Learns to Drive, and I’m thinking I ought to read these books in order. Wouldn’t you agree? So, dear readers, what movies have you seen lately? What books are you reading? Inquiring minds just have to know! What a great post! I love the idea of 50/50. I have not seen the George Clooney film, but that’s only because the one day I could it was sold out. Although I have to agree, why would anyone cheat on George! Lol! I’ve watched bits and pieces of Daisy Clover but have not seen it all the way through. Lately my kids and I have been getting into the old musicals, like Singing in the Rain, and Bye Bye Birdie, which they love! Thanks for a fun post! I’ve found you through Shenk it Up and am now happily following! Thanks for stopping by from Shenk it Up. Isn’t Nate just wonderful?? I caught part of The Bodyguard on TV, but I I flipped away after a few minutes because I want to watch the whole thing. Was she in any other movies? 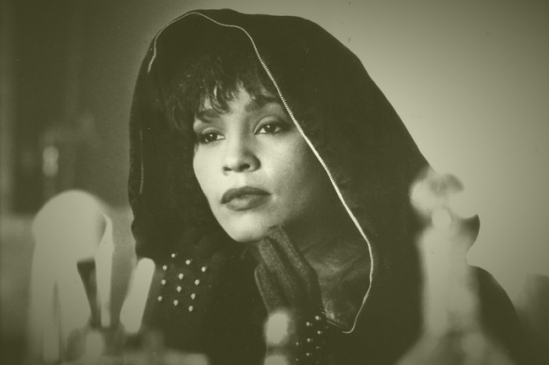 Whitney Houston also starred in The Preacher’s Wife, which was a remake of The Bishop’s Wife (starring Cary Grant, David Niven and Loretta Young). The original was much better. She also starred in Waiting to Exhale and Cinderella (a Rodgers and Hammerstein musical for television). That’s right. I have seen all of those. I forgot about them! I’m terrible at going to movies but have such a good time when I go… I recently watched (if you exclude the G-rated or VinDiesel movie recently watched with kids) Midnight in Paris and The Help… I enjoyed them both. Just finished reading Cutting for Stone (long read – forst 200 pages are a killer but after that I couldn’t put it down) and Far to Go (quick read and wonderful book!). My book club will be discussing my choice, The Paris Wife, in April – another great read! I am following your list looking for summertime reading nuggets – good luck on this quest! I LOVED Midnight in Paris. Number One, because I love time travel themes. Reason 2, it’s every writers’ fantasy to meet their writer heroes, right? Re The Help, I honestly preferred the book. It was a gem. M- I am a movie whore, so I hate to confess here. It’s a guilty pleasure. I was raised watching movies, have passed it along to my kids, and I continue to watch. I enjoy at least three movies a weekend, this past .. FOUR. Finished the ‘The Witch’s Daughter’ this weekend. Started a new book this morning. It’s a wonder I ever get anything done. I am trying to watch a couple of the Oscar nominated movies this week. My son and I had a date on Sunday. We went to see Journey 2. Not of the same caliber and definitely a rental, but the boy loved it, of course. I’ll check out your post and the other blogger you mentioned. Thanks for the tips. Are books on tapes count too? My commute is about 30 minutes and this where I catch up with books. The Bodyguard was at Whitney’s height of perfection. I love that movie. Good luck with your challenge. And can you believe it got bad reviews?? But then it broke all kinds of records and the album remains the bestselling soundtrack. For me, those songs came into my life at just the right time. It was absolutely the thing I needed to help me heal. I owe her a lot. Sigh. Well, Monica, we agree about George Clooney, just like we do about Sir Paul! But I never thought of The Bodyguard as having a happy ending. I found it bittersweet. The main characters obviously loved each other, but were not what the other needed. Poignant, yes. Always at this time of year right before the Oscars, I realize I have yet to see any of the major films up for nominations. Of course, that never stops me from casting my vote. I mean, George Clooney deserves to walk away with the Best Actor Oscar, I’m sure :-)! To me, the fact that she didn’t die at the end of the film, was a happy ending. Kevin Costner’s character was able to save her life. Perhaps if he still had been her bodyguard, he might have been able to prevent her death last week. And yes, I know, I’m mixing fiction with real life. But Kevin made for a great bodyguard, don’t you think? I’ve seen many of the films this year, except the Extremely Close or something movie with Tom Hanks. I hear that’s really good. I watched Woody Allen’s Midnight in Paris over the weekend. I loved it; best movie I/ve seen in a long time. I’ve only read two books so far this year and this rate I will be lucky to finish 15 this year. I picked up a copy of This Little Light of Mine; The Life of Fannie Lou Hamer by Kay Mills today. It is my read for Women’s History Month. Great project Monica. I look forward to the day I have time to join you. I love Midnight in Paris. It’s frothy and snappy and so different. Maybe it’s win best screenplay. I hope it gets some Oscar. Certainly deserves it! Sorry about the Descendants typo. I have so many memories attached to Whitney Houston that I was in shock when I heard she had passed away and more so for her daughter. I loved the Bodyguard and that soundtrack was amazing, I think I am going to watch it again too. I thought Kevin Costner’s eulogy was beautiful and Tyler Perry’s too. So, I’m trying to read 80 books this year and thus far I have read 4 – I’m on my way but I need to get it together. I already love your suggestions for books. Esp. The Weed That Strings The Hangman’s Bag – anything British, you know I will read for sure. I will add them all to my list. George Clooney is one of the few American actors I find attractive. I think Kevin Costner is the other. But 80 books? That’s incredible! Yes, you should definitely read “The Weed…” Not only is it British, but it reads like a Masterpiece Mytery production, I can see them turning this into a drama for television. Flavia is enchanting! I’ve watched “Inside Daisy Clover” several years ago. I think it was ahead of it’s time,don’t you? Wasn’t Robert Redford Gay in that? Great movie. “The Bodyguard” O, My. I’ve watched that at least 5 times. btw, I hear 50-50 is superb & who doesn’t LOVE George Clooney? Kim, I can’t believe you’ve seen Daisy Clover! I didn’t think anyone had heard of it, despite it’s terrific cast. And yes, Robert Redford played a gay guy and it was SO ahead of its time. I first saw it as a young teen, around 13, and I think that aspect of it went over my head, because I did not remember that. I remembered it more as a Star is Born type of story. But I say, kudos to them for making such a film. I’m an OLD MOVIE buff. I’m taking my children to see Hugo in 3D today — I was THRILLED when I learned it was coming back to theaters due to its Oscar bump. Now we can see what all the fuss is about! Best of luck as you continue to pursue your goals, Monica — sounds like you’re on your way! Mikalee, be sure to tell me what you think of Hugo. I’m really curious and have yet to see it. Cool news about your student, Ben Rogers. Hope you review and write about it on your blog. Thanks for everything. I need all the luck I can get!! I think you’re going to meet the challenge, Monica. Remember, February is the shortest month, so you’ve got some leeway! As for me, I’m up to my ears with work, so I haven’t been to a good movie all year yet — reading, thankfully, is a different story, ha! I think if I’m going to make it, I need a few months to have 41 days instead of 31. I need all the help I can get! Sounds like you are coming along nicely on your 50-50 challenge. I’m on track as well, and recently finished Velva Jean Learns to Fly. So glad you are coming on the Adventure by the Book with her this Friday. It will leave you wanting to read the first in the series, and there’s also going to be a third! Thanks for sharing your reading and film experiences. Great recommendations. Will you keep a list? I think I could manage the book part of the 50/50 challenge. I go to several book clubs, so that keeps me reading a lot. My latest book club favorite was The Tiger’s Wife by Tea Obreht. I loved the cyclical plot structure and use of folk tale to tell the story. I used to watch more movies before I loaded up my dvr with Downton, etc. 🙂 I have been trying to watch some of the Oscar contenders and I saw Extremely Loud and Incredibly Close a couple of weeks ago. It was very well done and made me want to read the book again. Never mind about your list… I just found it. What a great resource for us! Glad you found my Fifty Fifty page tab. I’ll be adding the February list by the end of the month. The eulogy was truly emotional. You could tell how much love and respect Kevin had for Whitney. Very touching. Hey, did you notice that Nikky44 said in her comments that she loves a book you wrote? Nice! Why would anyone cheat on George? Cause he’ll eventually dump you anyway? Are you going to see Frida? Such colorful scenery and I love Salma Hayek. Do you let your visitors know what you’ll watch beforehand to join along? Such a beautifully sad ending to Whitney’s homegoing. Peace is hers now. Frida is one of my favorite movies! I’ve seen it a few times already. Salma was amazing! It’s hard to let folks know ahead of time what I’m going to watch, because often I don’t know myself. But it’s a good idea, Totsy, so maybe I’ll tweet it when I’m about to see a movie. Thanks for the idea! Never been much of a movie goer but am looking forward to when CARTER comes out soon. It is based on the Edgar Rice Burroughs John Carter of Mars series. I read all 10 books when I was 13-14 years old. A 50 year pre Star Trek thing with all the magic in mere printed words. Wow, you have been busy! I know this undertaking is part of the Fifty Fifty Challenge but is sounds like a real pleasure. It’s fun, Bassa, because believe me, last year I probably only read three books the entire year. So I’m really pushing myself to read more, and I’m enjoying it, too! Unfortunately I have no time to watch movies at home or go to the movies, but I love reading. I usually buy and read french books, but trying to now practice my English better by reading Blogs in English. The First and last English Book i have read since really long is “Exploring Michael White’s Concept of the “Absent But Implicit” by Jodi Lobozzo Aman, LCSW-R, and really loved it! Nikky, your English is fabulous, I had no idea it wasn’t your first language. Good for you for making such an effort to practice it. Jodi comments here often, so I’m sure she’ll be happy to know how much you loved her book. Thanks for sharing!